(Broomfield, Colorado) – June 13, 2017 – Phonesuite, a leading provider of communications solutions for the hotel industry for more than 25 years, today announced that it will launch the Exceptional Service ACD Call Center Module at HITEC 2017, with onsite demos available throughout the show at Phonesuite booth #1319. This latest Phonesuite product offering integrates seamlessly with its existing Managed VOICE platform, offering real-time monitoring and analytics to help hotels reduce the costs associated with managing guest service requests, increase their staff response time, and subsequently elevate the guest experience. 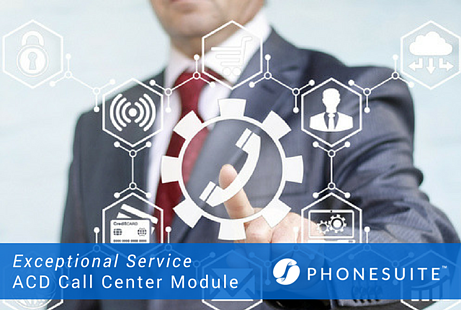 The Exceptional Service ACD Call Center Module was designed by Phonesuite as a cost-effective, web-based application that can be deployed in one hotel, or across an entire portfolio, by leveraging Phonesuite’s Cloud-based platform. It enables front desk and service desk supervisors to more effectively manage personnel and guest interactions through real-time dashboard analytics, monitoring, and reporting and transparency of their agents and call activity in one or multiple queues per supervisor. Key features of the ACD Call Center Module include Listen, Whisper and Call Take-Over modes, along with management alarms for call duration, agent availability and wait time per queue. Phonesuite is the single-sourced, hospitality communication solution for hotel managers and owners who need a reliable, simple-to-implement telephony platform that supports both SIP and analog phones. For over 25 years, PhoneSuite has been the proven choice for modern, open-architected integrated hotel communications for over 5,500 hotel installations. Our products, combined with our nationwide dealer support and engineering expertise, create reliable communication solutions that meet or exceed all hotel requirements. Our turnkey solution is also now available factory direct. For more information, visit Phonesuite.com or email info@Phonesuite.com. Previous StoryWhat Your Hotel's Marketing Strategy Can Learn from… Dating Sites?